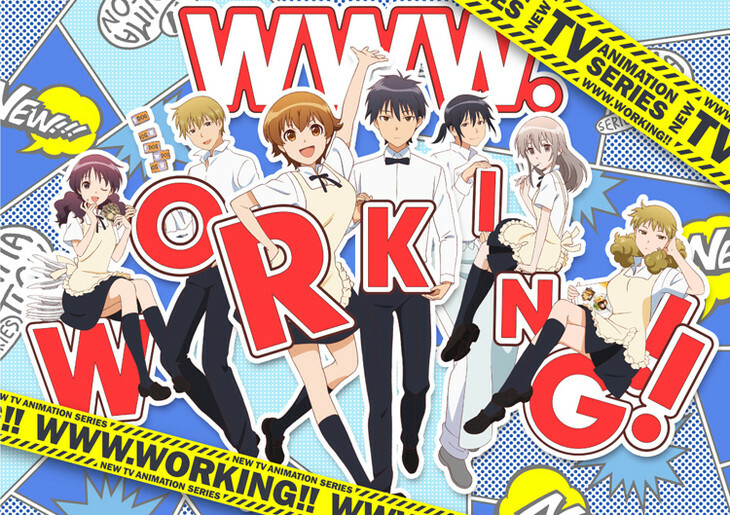 Homepage › Reviews › TV Show › WWW.Working!! On July 25th, 2015, Karino Takatsu, writer of the Working!! manga, began her new project, a spin-off webcomic. which takes place in another Wagnaria restaurant. This new slice-of-life webcomic revolved around Higashida Daisuke, and a brand new set of characters. On October 1st, 2016, the anime adaptation of WWW.Working!! premiered, after the fans were teased about an adaptation of the webcomic back in 2011, with an April Fool's Day video of the two main characters announcing they were getting their own anime. It is being animated by A-1 Pictures, the same studio that worked on the original Working!! anime. Higashida Daisuke, voiced by Nakamura Yuuichi, is a high school freshman, who is forced to take a part-time job at Wagnaria after his father's business goes bankrupt. He finds himself working with some odd characters, like Miyakoshi Hana, whose cooking is said to be dangerous, Muranushi Sayuri, who never smiles and can see ghosts, and Sakaki Kenichiro, their manager, who seems to lack basic education. This anime is very fun and light-hearted, and it will not take long to find yourself favoring one of these characters, whether it's the serious Higashida, or the rough Miyakoshi. If you have not seen the original Working!! series, you will still enjoy the spin-off. It does, however, manage to give you the same happy feeling the original gave off. If you are a fan of the original, and have not seen the spin-off yet, I would highly recommend it. Overall, I would give this anime 4/5. It is somewhat lacking in a solid story line, but seems to make it work with the short scenes connecting the episodes. The characters are very memorable, although could be given some more development as the season goes on. The opening and ending, featuring the voices of the main female and male leads, respectively, are very catchy and fun, and help set the mood for the episode. If you have been looking for a light-hearted anime, then you should check out WWW.Working!!. Dynasty -- A Modern Masterpiece?